[Update] Asakusa Kannon Onsen closed down in June 2016. Responding to some requests, I'm going to write about an onsen in middle of a tourist spot in Tokyo. You might have heard about Sensoji-temple（浅草寺） at Asakusa（浅草）, downtown Tokyo. It's popular among tourists and ranked 6th in TripAdvisor's "Top 20 sightseeing spots in Japan" (See my post dated Apr. 7th). But do you know there are two onsens just a stone' throw away from Senso-ji? One is Asakusa Kannon Onsen（浅草観音温泉）, located less than 100 meters away from Sensoji, near five-story pagoda. It's easy to find this ivy covered old building. Its classical GETABAKO (shoes rockers) may impress you, but generally it's rundown without a doubt and desperately needs some renovation. The onsen water is... well, it's transparent by filtering and looks like tap or well water. When I soaked myself, I couldn't recognize the touch of onsen. It was more or less same as a tap water bath for me. And I found several white tablets in the tub for chlorination. Sounds like a swimming pool, doesn't it? Entrance. Enter from left side door. But still mosaic tile art on the wall is nice (see the top photo), and you can enjoy atmosphere of 1950's bath house especially in the changing room. An old lady working there told me this place has about 40 years of history, but I doubt it. A sign board on the wall of changing room dated 27th year of the Showa era, it means 1952. Recommended for antique mania than soak addicts. Inside of the changing room for ladies. Equipment: No complementary soap & shampoo. A hand towel rental costs ¥150 (including ¥100 deposit). Access: About 10 minutes walk from Asakusa Station of Tokyo Metro. I went only to three sento down town Tokyo during my stay. Google France and Google Japan in english does not find the same sites. I will take opportunity of your information to visit some when i come back to Tokyo. I like sento more than spa like places. I think you can see Japanese daily life more. This Asakusa Kannon Onsen isn't sento, but the other one (Jakotsuyu) is sento. 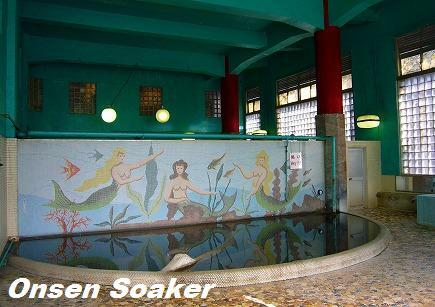 Admission fee of sento is cheaper, at ¥450 in Tokyo (Each prefecture set the admission fee of sento). My experience in sento bathing is limited but i have two nice cases to recall. First in Komagome in my neighbourhood i meet many old guys. They wanted to know from where i come, do i not have a bath it was really frendly. The second time in a small town called Yunishigawa in Tochigi ken. I went there with an europeen female friend saturday afternoon after a hike.It was an old small wooden buiding with a natural very hot spring.Six boxe for the cloth. along the wall there a few plastic basin,soap bar and small towells. The latter one you mentioned isn't a sento, as sento never allow mixed bating. I guess it was a kyodo-yokujo named "Yakushi no Yu" at Yunishigawa Onsen. The two first couple who were tourists like us they spread some water over their body and then entered in the bath.The other person -the senior couple but also two guys and later a mid age lady - who came in this place had all their soap, basin and towel allong the wall, they spent a long time to wash their body and then soak short time in the bath. If was any way one of the best place were we could experience the feeling of taking a bath in the japanese tradition. I stumbled into here one day up in Tokyo. The wife let me go in as she waited outside. Nice baths in a great old building, but, sadly, a little overpriced when compared to what I can get here in Kansai for ¥410 or less. Thanks for your comment. Yes, I think admission fee here is rather expensive. The Jakotsuyu, the other onsen in Asakusa is a sento and costs ¥450. I will write about the Jakotsuyu soon. Linked your site I Love ゆ as "Japan Related Sites".